HCTI Culinary student packages the remaining coleslaw from the days lunch rush to be refrigerated and repurposed at another time. 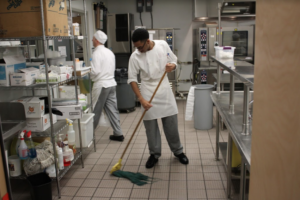 Students enrolled in the Hospitality, Culinary, and Tourism institute (HCTI) at the Monroe Center have the opportunity to jump into and get to practice their career trade each day in their 6,500-square-foot facility. “We offer high quality hands-on training by experienced professionals in the industry so students are learning the most current and relevant skills under chefs and instructors currently working in our community,” Elizabeth Rose said, HCTI Manager. 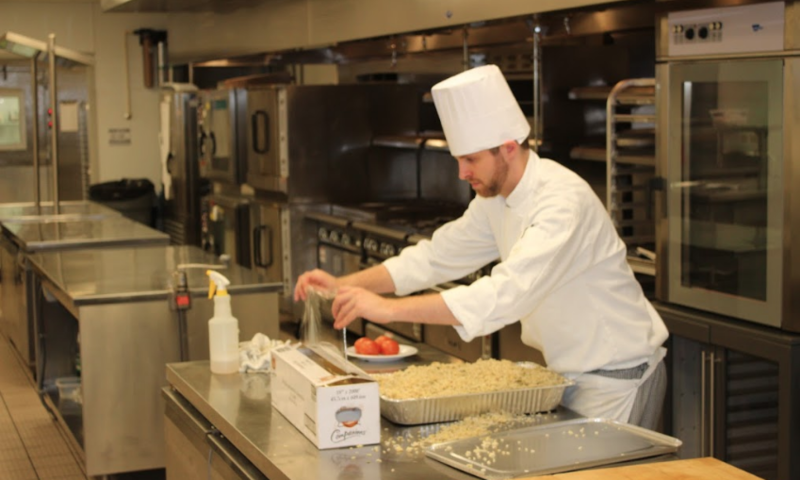 Perhaps the most state-of-the-art culinary instructional facility in Western Maryland, the space houses a 48-seat restaurant with two commercial kitchens. 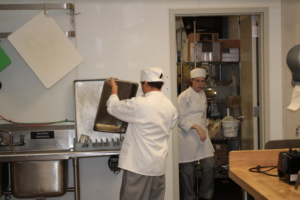 The first kitchen includes an open à la carte kitchen while the other hosts a instructional kitchen with individual work stations for 18 students. With a hand picked staff and upgraded facility, the Monroe center promotes intensive learning experiences. Chad Bro, HCTI student, expanded on his experience at the facility. Students in the HCTI program have an entire wing of the Monroe Center to themselves which allows for an ease in communication and a lightened educational atmosphere. Ron Colonio, another HCTI student, explained the atmosphere at the facility. 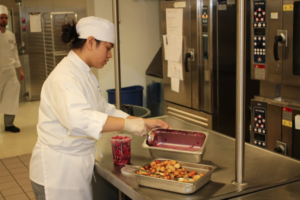 Some students may feel more comfortable in this atmosphere knowing each person around them is working together towards the same common goal, like culinary student Kaitleen Borromeo. Fellow HCTI Culinary student mops up the remains of Fridays mexican lunch buffet in the Monroe Center. The HCTI institute at the Monroe Center maintains a student-run restaurant called ‘200 Monroe’ as part of it’s program where classmates work together to serve guests as part of their grade for the spring semester. They are required to do work a 240-hour internship in the industry while in the program as well. The restaurant experience is technically the last course of 12 students take in order to graduate the program. “After they take a number of cooking and baking classes; courses in purchasing, food and beverage operations, event management, etc, they have learned all the requisite skills in order to run the restaurant,” DeRose said. DeRose has worked to create this idea of learning, and with the renovation of the Monroe center and its facilities, it has finally come to fruition. Organizing for classes to meet once a week for fifteen weeks, the first four-to-five weeks of a semester are used for hands-on training to prepare for working the 200 Monroe restaurant the proceeding 10 weeks. “Before we open the restaurant, we train them on all aspects of service, including how to use the point of sale system, finalizing our menu items, and the cooking of said menu items,” said DeRose. At this point, the students are fully prepared to run 200 Monroe as a full service restaurant for the following 10-weeks it is open. HCTI has just launched a lunch express this semester where a new buffet style cuisine will be served to anyone that may attend. Every Friday starting at noon in the Monroe Center on Monroe Ave. Frederick, MD. Sommelier and HCTI Hospitality and Culinary student, Chad Bro, cleans one last container leftover from the days lunch rush.